A most memorable weekend of racing at Martinsville Speedway for the Wood Brothers and the Motorcraft/Quick Lane team ended Sunday afternoon with a 15th-place finish by Paul Menard in the team’s No. 21 Ford Mustang. With the return of NASCAR to Martinsville for the first time since the passing of team founder Glenn Wood, the racing community paid its respects to Wood, who died Jan. 18 at the age of 93. On Friday, more than 1,000 friends, family members, fans and NASCAR personalities gathered at the Wood Brothers Museum in Stuart,Va., for a Tribute to Glenn Wood. On Sunday, prior to the start of the STP 500, Clay Campbell announced that they were renaming the Turn One Tower the Glenn Wood Tower. When the cars lined up for the start of Sunday’s 500-lap race, Glenn Wood’s “Backseater” Modified racer paced the field with his brother Leonard Wood at the wheel. When the green flag dropped, it was back to business for Menard and the Motorcraft/Quick Lane team. Menard started the race from 14th place, moving up one spot in the line-up after William Byron’s car failed a post-qualifying inspection on Sunday morning. Menard held his own throughout the first 130-lap Stage, ending that segment in 18th position. Stage Two played out in much the same fashion as Menard finished that run in 17th place. The final run to the checkered flag saw him gain two spots to 15th place. Eddie Wood said his driver, team and crew turned in a commendable performance in a highly competitive race. Wood also offered his congratulations to race winner Brad Keselowski and his No. 2 crew from Team Penske. Wood said that as he and his family reflect back on the weekend tributes to their father, they realize just how much their NASCAR family means to them. 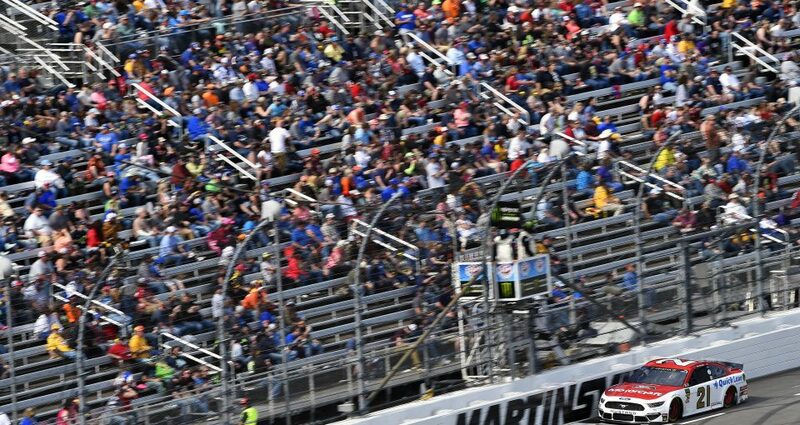 He said the naming of the grandstand at Martinsville came as a surprise and was probably more fitting than even Martinsville officials knew at the time the decision was made. “When Len and I used to come to the Modified and Sportsman races years ago, that’s exactly where we sat,” he said. “And it means so much to know that the only other people to have grandstands at Martinsville named for them are Bill France, Clay Earles and Richard Petty. Menard and the Motorcraft/Quick Lane team will return to the track next weekend at Texas Motor Speedway.